You don’t come to Moses Cone to hike. 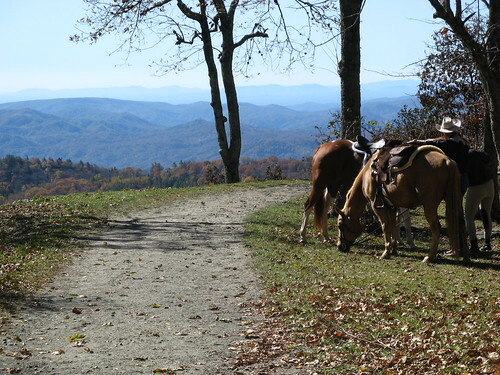 The trails are all fat, gentle, and free of the roots and boulders that bring such pleasure across the Blue Ridge. Leaf Season weekends bring out altogether too many people and just a tad too many horses. Here’s why you might want to go anyway — at least once. 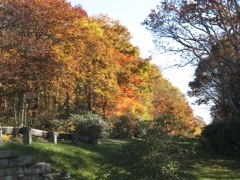 Moses Cone Park gets lots of color. Alas, he did plant a bunch of non-native trees, which means you’ll see she shades unusual in the rest of the Blue Ridge. You can’t avoid people during Leaf Season. Moses Cone is basically a municipal park that happens to be in the mountains — sure, it gets lots of people, but it’s also built to handle them, unlike all the backcountry trails teeming with newbies and wannabes at this time of year. There’s a great history lesson here. Moses Cone built a huge textiles empire in the late 1800s (the so-called Gilded Age) and was one of the earliest preservationists. He loved the mountains and bought a huge estate to protect a few of them. And it’s probably no stretch of the historical record to say he worked himself into an early grave (his widow outlived him by more than 30 years). 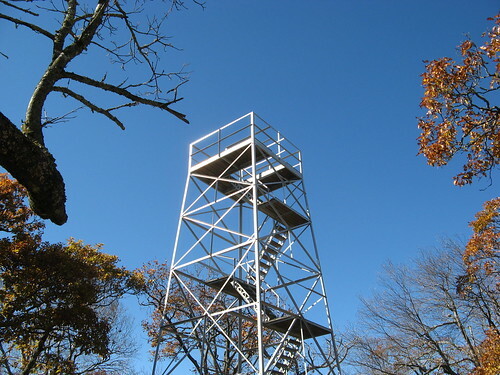 I did a floor-to-ceiling walk at Moses Cone, from the Bass Lake entrance (off U.S. 221 just outside of Blowing Rock) to the high point at Flat Top Tower — five miles one way with about 1,350 feet of ascent (5 percent average grade, how easy can you get?). I walked around Bass Lake at the beginning and the end, which upped my mileage to just under 12. OK, time for some pictures. I usually edit my shots down to the ones that best illustrate my hikes, but I made an exception this week and created a quickie slide show to give a broader view of how things look during Leaf Season. Click on this link to check it out. It’s just pictures and links, no captions. 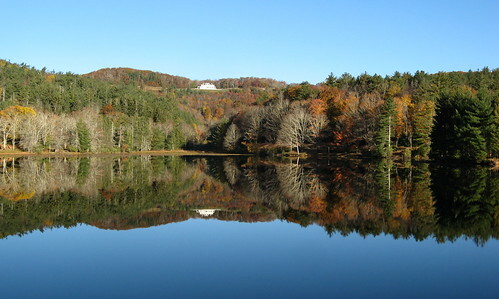 Bass Lake is the showpiece of the park’s lower section. Get there first thing in the morning or late in the afternoon if you’re a shutterbug hoping for shiny reflection shots. Here’s a look at the lake with the Manor House high on the hill above. The walk around Bass Lake makes the trip worthwhile. 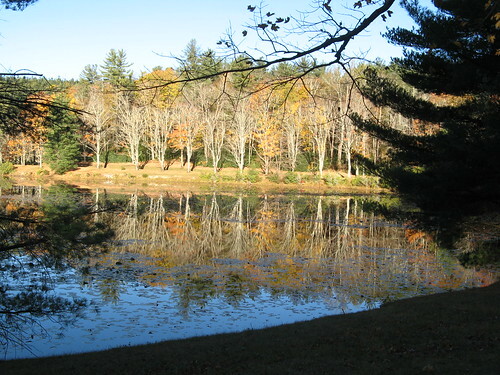 This reflection shot shows how many of the trees have already lost their leaves. The season really peaked last weekend and lots of color has already been blown away by the strong winds that blast the high country much of the year. From a distance the hills look mostly brown with only a few splashes of color here and there. But once you get off the road and start walking into the woods, the colors really pop (until the leaves fall off and die, of course). 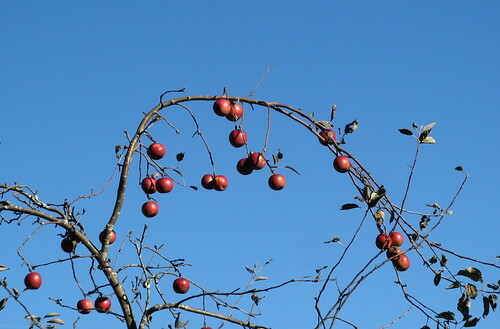 The walk up the hill to the Manor House passes an old apple orchard. A sign notes that several years of pesticide applications have essentially poisoned the soil, making it dangerous for kids to play there. 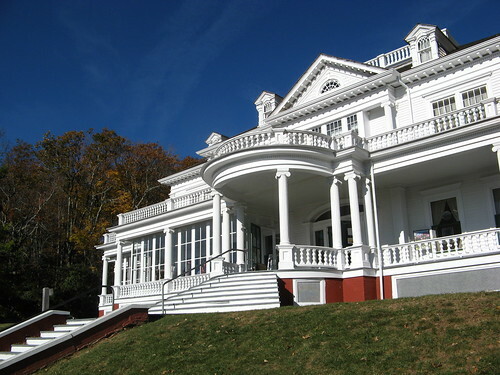 Here’s the old mansion Moses Cone built here. It has a craft shop that attracts throngs of tourists, so the parking lot often fills early on weekends. 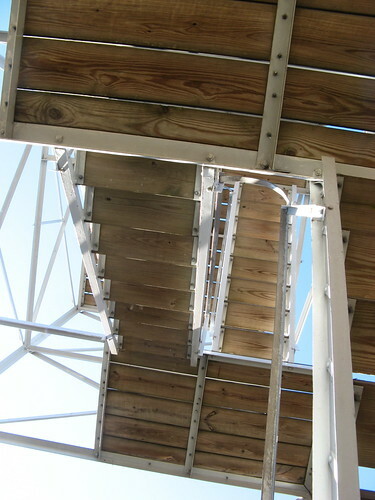 The hike up here has several zig-zags and is not especially steep. I’m guessing these are some of the non-native trees. I haven’t seen this color on any of my other hikes this year. 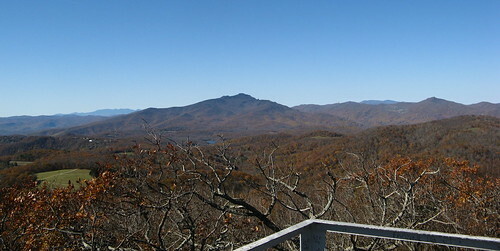 From the Manor House, there’s a trail under the Blue Ridge Parkway (bear left on the carriage route behind the Carriage House) that goes up to Flat Top Tower. 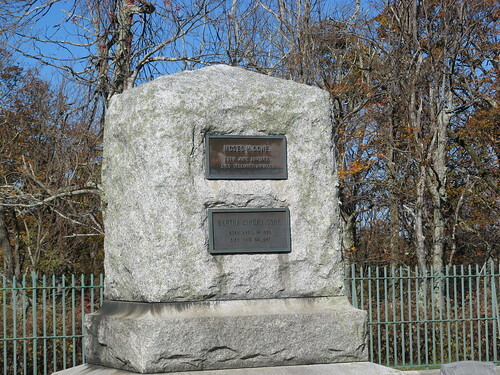 Along the way you can stop at the gravesite of Moses Cone. Here’s the headstone. The gravesite also has a clear view of the nearby mountains, as if to ensure the deceased will have that view for all time. The hike to Flat Top Tower is a bit tiring, as much from the distance as the climb. Nothing like proof that your climbing is done. Well, almost done. You don’t come all this way and skip the view from the very top. Some of the many horses on the trail. 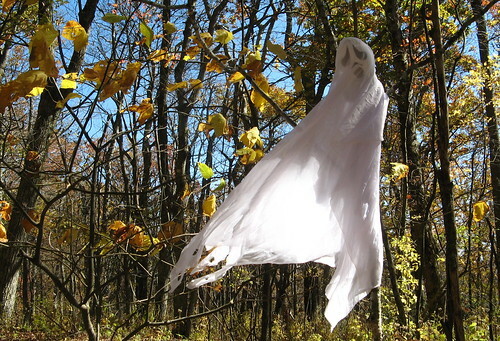 Somebody’s in the Halloween spirit. Coming back down the hill, looking out over the park’s main section on the Blue Ridge Parkway. This section on the way back down seemed especially colorful — another example of vivid color that must be seen up close to experience. 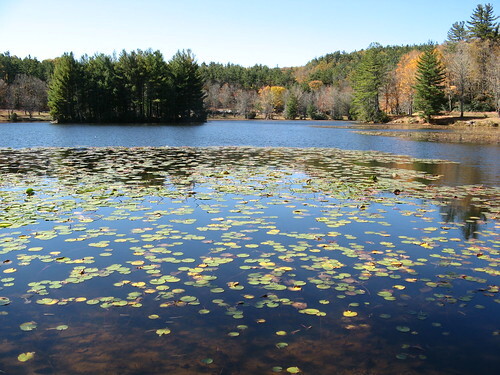 Here’s one more shot of Bass Lake on my way back to the car. That does it for this week. I’ll probably hike closer to home next weekend, as the fall color’s just starting to hit is stride down here in the flatlands. 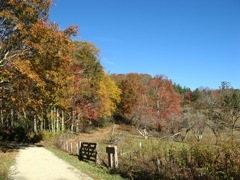 Last year’s fall colors road trip on the Blue Ridge Parkway. 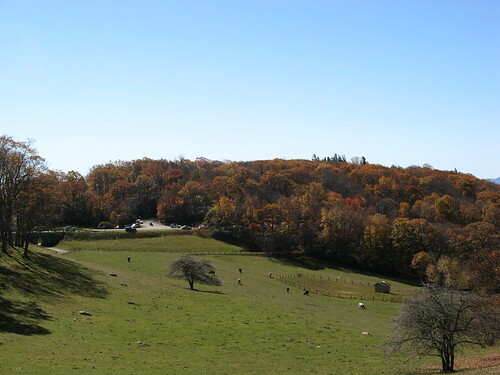 Virtual Blue Ridge guide to Moses Cone park. What beautiful scenery. That’s what it looked like in Missouri this weekend. Totally gorgeous. Nice, Tom! It is what it is! Much to be appreciated! Nice pics. 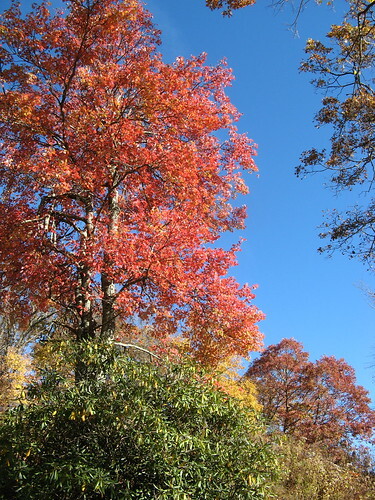 In regards to the fall colors, do you know if they are still changing in the Smokies? I am planning a trip to Gatlinburg this weekend and was hoping the trees haven’t lost all their leaves. 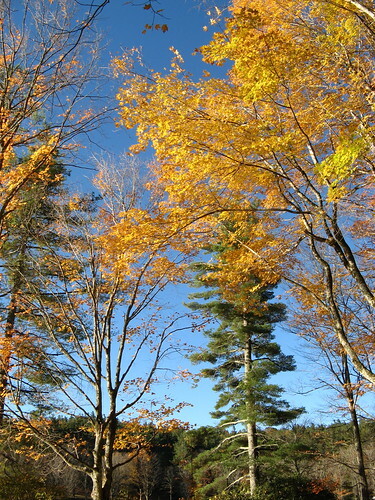 Dan: I can’t imagine the trees being bare just yet, but I wouldn’t count on much color beyond brown. 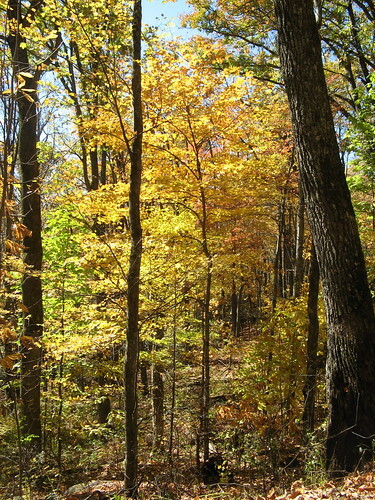 This is not such a bad thing if you’re actually hiking in the hills — fewer leaves mean better views. wow …its nice picture and article …thanks for sharing..